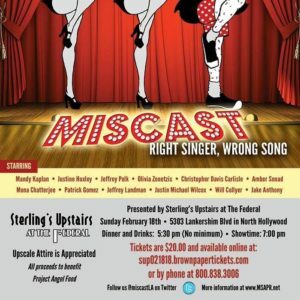 Mindy Kaplan’s Miscast had its 23rd outing at Sterling’s Upstairs at the Federal on February 18. Another sold-out house enjoyed another fun evening of Broadway show tunes sung by someone of the wrong gender, age or whatever. Kaplan bookended the show with a couple of non gender specific numbers from Hair—“Aquarius” and “Let the Sun Shine”—but the audience didn’t mind because the voices of the entire cast and joyous sentiments of love and peace that were expressed were so strong. Justin Michael Wilcox found his inner female self twice to cry his way through I Love You, You’re Perfect, Now Change’s “Tear Jerk” and to assert himself as Angelica Schuyler in “Satisfied” from Hamilton, with as assist from Will Collyer as Lin-Manuel Miranda. 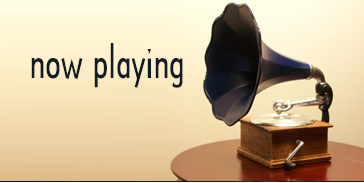 Jeffrey Polk and his boa really enjoyed sashaying through “Don Juan” from Smokey Joe’s Café. 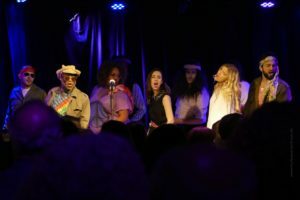 Kaplan returned to the stage and strutted around as The Wedding Singer in “Somebody Kill Me.” Amber Snead channeled Nathan Lane in “The King of Broadway” from Mel Brooks’ The Producers. Patrick Gomez enjoyed wearing a tiara in Craig Carnelia and Alma Cuervo’s “Diary of a Homecoming Queen” from Is There Life After High School? Thirteen-year old Olivia Zentsis showed maturity in Bye Bye Birdie’s “What Did I Ever See In Him”. An adult Jeffrey Landman found his inner child star as he sang “Little People,” from Les Miserables in which he played the tiny revolutionary Gavroche during the musical’s original Broadway run. Another topsy turvy night was had by all. 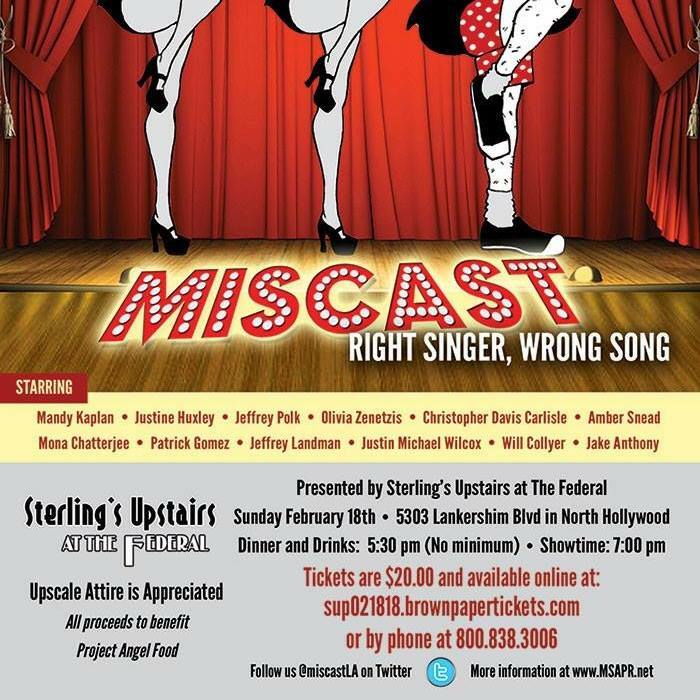 Watch for another Miscast in about three months and get your tickets early for they always sell out.